The third dam is none other than original import “World K’s Rikitani”, one of the very few 100% Tajima blood animals imported from Japan. RIkitani has well known sons – “Longford Tojo”, “Longford Zaki”, “Longford Honjo” and “Overflow Katsumi” – (all sires with high EBV’s for marbling, marbling fineness and eye muscle area). Females from the Rikitani’s are extremely rare and the family members we have processed have been nothing short of exceptional. 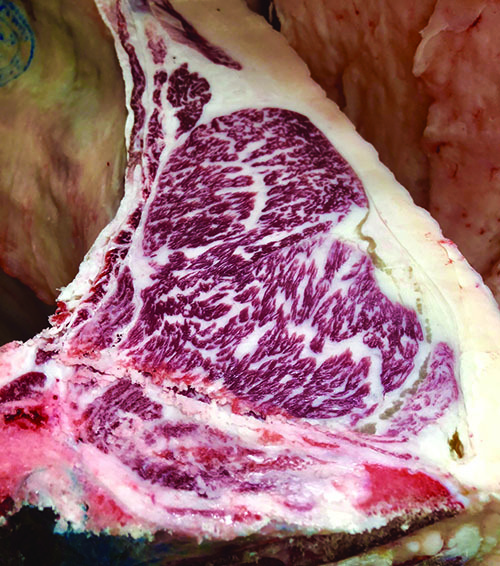 If your looking for guaranteed high marbling / high marbling fineness, this is the bull.